Oh, a few more things–just to head off some of the comments–yes, there is a table with a puzzle on it in the background. Yes, there are some giant Shaquille O’Neal-sized sneakers in the hallway (they aren’t mine!) It may surprise you all to know I don’t have a secret studio in my house in which to film my oscar-worthy vlogs and videos. So my house is a mess. There is stuff in the background. And no, I didn’t film myself in the jacket twirling the baton because as you can see my son wore it and it fit him perfectly. He’s only nine years old! (and I do plan on using this video as future blackmail for him when he starts dating) I truly didn’t want to embarrass myself any more than my last vlog (don’t think that’s possible but you never know) But that IS me twirling the baton, I swear. I could only fit my arm in the jacket. I’m not ashamed. It was all those damn peanut butter cups last week. I will never eat another one as long as I live now. Oh. My. God. I almost peed my pants, which are entirely too tight from all the peanut butter cups. This is priceless. Priceless I say. I was mesmerized. I wanted to come work on the puzzle. I didn’t notice the shoes. I loved it, but it did make me slightly queasy…and I had to keep putting my hand on the couch to keep for feeling like it was spinning. Your talent is immense. Katy, my reply to you is somewhere below, I’m not sure why, but I am typing on this stupid iPad so that’s probably why, not that I’m a tech moron or anything. Now I’m in love with plaid! I want plaid stuff! Your son has nothing to be embarrassed about – that’s tremendous skill. And if he ever had a blank moment during a date, he could always do a baton twirling demo. Wonderful video! Jean, he was very proud. After he dropped the baton, he then went outside and started using it as a baseball bat, so he’s multi-talented, that boy. I am sorry for the motion sickness. I think I broke a record for using every single video-making animation in history. I couldn’t help it, I got carried away. Good to know you almost peed your pants, that was my intention. My only regret is my daughter wasn’t in it, but we’ve all been deathly ill all week and she’s still not herself, poor girl. Oh, I hope she feels better. Put her in the next video – and I’ll take a dramamine before I watch. We had 2 German Shepherds at our wedding….not ours, but they were there, none-the-less. Two German Shepherds, huh. Love to hear the story on that one! OMG, you are SO talented!! What a fantastic video!!!! Thanks! but it was all the magic of my windows live movie-maker. And my break dancing son. Now I am jealous — I want one of those movie-maker thingies. LOL. And your son is fab! You should get one. I think this came with the computer, I’m not sure. I don’t even know how to turn the computer on half the time…so this movie-maker thing is easy. Fantastic! 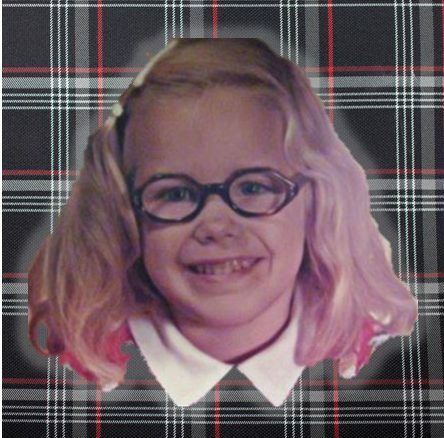 Now I am seeing the world through plaid colored glasses! Your son rocks the house too! Love the special effects and glad to say I didn’t experience any motion sickness! The video has a lot going on, doesn’t it? I would say, way too much even. After this week I think the impossible has happened–I’m sick of peanut butter cups AND plaid. But I’ll never tire of the fabulousness that is my snazzy jacket. Oh,yeah, ya gotta capitalize it! Always! Thanks, Susie. You are freaking amazing. That’s it. Darla, you are amazing. Absolutely amazing. And your son is adorable. This video is a classic. Plus, I am now completely over not winning the jacket myself because I could not even begin to compete in the”what would I have done with it if I had won contest,” either. Thanks, Elyse–my son is adorable. Beyond adorable. He’s what made the video. I’ll be sure to burn any trace of it in a few months so he won’t be mortified in a few years when his girlfriend stumbles across it. Don’t be a fool, Darla, keep it safe. That way you can chase away all the undesirable girlfriends and choose his mate FOR him, like any good mother should. That was awesome!! Well done. You did the jacket justice. oh, thank you, Carly! Too bad I can’t actually wear the darned thing. Just lose10 more pounds and maybe I can. Dang girl- you have some mad skills there! Baton twirling? Editing? Plaid wearing? I’m in awe. Love it! Aw, thank you! That means a lot coming from someone who had one of the best vlogs I’ve seen in awhile. You really rock a tiara. Fabulous! Loved the video and the song. After seeing your son, my son and I will definitely have to visit you this summer when we go to Maine! We don’t twirl batons around here, but we do twirl light sabers, and all variety of sticks. And you made the video using the same program I have on my new laptop- cool! I’ll have to get creative now. I didn’t even notice a puzzle in your video; now I’ll have to go back and watch it again! That would be awesome. Yeah, we had a Darth Vader light saber, a few plastic t-ball bats. We could all get together and the boys could break things, it’d be a blast, Sue! That puzzle has been sitting on that table for months now. It is just too hard for me. The pieces are microscopic and my eyes are failing–bad combo. Are you sure, Joe? I just saw your captivating video about the rebel hair. I was in suspense the whole time, good stuff. I’ve had time to digest your video. Firstly I was intrigued as you mentioned your lack of photoshopping skills on the Reese’s post, although I loved them! Then I see this video full of tricks and effects and I was like “say whaaa?” (I can’t carry off street talk). But I read you used some windows thing and was amazed to see my laptop has this program built in, so have been playing around with it all night. So exciting to have a new gadget, and after I was about to do away with my attempts at photography this has made it more interesting now and was making slideshows of my holiday snaps -badly but will be fun to learn. My friend did that video for me such is my ability on all things technical, I just sat very still the whole time, which was no mean feat as I was tipsy. Yeah, you will love the little video-maker. It is SO easy. If I can do it, even a tipsy Joe can do it. It is addictive though, once you start, you just keep going and adding more to it. It was nice to have that distraction while I was up all night from insomnia. i’ve been trying to do that with my drumsticks for years…maybe i need to wear the plaid jacket…. I’d be happy to loan it to you, but then I wouldn’t be cool anymore and really, let’s face it, at my age, that jacket is all I have. That is a great idea! I should have added other little ‘easter eggs’ in the background to see if you guys could spot them, that would’ve been fun. But my blog isn’t about fun or doing clever things like that as you know. Darla this was excellent entertainment! Wonderful editing, too – seriously. Fun, fun, stuff! Bravo! Thanks, Lenore. I have to say, I’ve seen this video so much, I dream about it and that’s not a good thing. The only reason I did it is because I had insomnia all last week and why bother doing something productive like clean or write a book when I can edit a Kei$ha video? awesome baton skillzzz! seriously, loved watching your video this rainy Sunday – nice work! Aw, thank you. See, this makes me smile because my brothers always made fun of my baton skillzzzz, but now I can tell them it was all worth it because I cheered my blog readers up on a rainy day. Mags, that song worked, I have to admit it. Not my cup of tea but my kids loved it. Bravo! You did it. Thanks for the chuckle. And now that song’s stuck in my head. You so deserved that jacket. I know, I know. The song will never die. And believe me, I’ve tried to kill it…replace it with something less annoying like MMMM….Bop. What just happened? I pushed play and woke up in a field in Romania. That was the most trippy thing I’ve watched since college and I didn’t even have the drugs or black light to fully enjoy it. But I do feel like skipping class tomorrow. You seriously have to go on the set of America’s Got Talent with that baton-twirling thing. You are amazing! I know you’ll get on there. Bring the plaid jacket. Black light! Oh, I used to want one of those. My older brother had one and this trippy Stairway to Heaven Led Zep poster. God, do they still make those? I am sorry you were tripping, Angie. Just be glad I didn’t use the 3D effects. I did, your loss. But actually it was probably worth it for you to not have to listen to Tik Tok. So…between the intro, the video itself and the comments I can’t stop chuckling..all right, laughing…hard. Oh! And the fact that only your arm/hand twirling the baton was in view, that just sent me over the edge. Haha! Do you know how hard it was to do that? Okay, I am a giant klutz. I had to use my left hand to start recording on the webcam, then twirl with my other, then hit ‘stop’ record, all while twirling that baton. It was too much. Your video skills put my Photoshop skills to shame. NO way. I love your new banner, too. Your post was seriously perfect. You’ve got a rising star on your hands Darla. I can tell his college application will involve videos! I take it you find this funny? Where’s The Academy? I want to nominate you for all kind of awards – Best Original Screenplay, Best Supporting Actor in a Baton-twirling Role, Best Really, Really Tough Jigsaw Puzzle Gathering Dust In The Background and, of course….Best Jacket. By the way, did you notice my clever use of the jacket? How it hangs beautifully from my ellipitical? I was just on that torture device today for 40 excrutiating minutes…heart exploding, vein in forehead throbbing…cursing up a storm and huffing and puffing so that maybe, one day, I could be skinny enough to actually wear it. Well, at least wear it AND button it up. It DOES look lovely on your elliptical. I actually gained so much Reese’s weight last week, I hope I never see one again. Except now I’ve got a taste for them – it’s like how when a young vampire first tastes human blood, they’re never satisfied with chipmunk blood (sorry Jules) again. I’m sabotaging myself! Ugh, I know. I flip flop from never wanting to see another Reese’s cup–egg-shaped or otherwise–as long as I live, to wanting to stuff my face with them. The Easter bunny brought us two giant bags of the eggs and they are all gone already. I weighed myself the other day and fell to my knees on the scale, bawling my eyes out and wailing why??? oh dear God, why did I eat those damn Reese’s?? Why, I am plaidsitively plaidtered by your kind words, Barb! And yes, please, come to me if you need a cool, but absolutely useless video. Too bad I couldn’t find employment in that field. OH. MY. GOD. Darla!!!! You have outdone yourself!!! Holy crap. I LOVED that! I don’t even KNOW how you did half of those color/transition effects (Okay, let me nerd out. What software did you use?! ), AND you had a perfect Spaceballs clip! OH! And I didn’t even MENTION the serious baton-twirling skillz! What CAN’T you do?!?! I am seriously applauding you right now! That was so great!! Ok, I have to admit I couldn’t wait for you to see it (along with Peg) because you are the video goddess. I used this built-in ‘windows movie live’ dealio… I guess it just came with the program? or computer? I don’t know, but it is so easy to use, you could have a field day with it, I’m sure. Remember that little video of me singing about WordPress I sent you? (how could you forget!) Same program. Only this time I made sure to use every single option on there, to totally blow everyone away with my cheesiness! It worked I take it? Yeah!! As for the baton, thank you, I was very good back in the day. Well, until it came to actually throwing the damned thing in the air, and spinning around to catch it… then it would just all go to hell. I feel bad that I didn’t read blogs yesterday, because you would have gotten my standing O much sooner, when you should have! I am TOTALLY blown away! I l-l-l-o-v-e it! It is truly top notch, and you are officially a video goddess, I’d say! Well, what with you being Freshly Pressed for an eternity…. (congrats again!!!) and winning Paul’s contest with quite possibly the funniest caption ever…. (just a tad jealous, but I’ll get over it, sniff, sniff) oh and now you’re a finalist in B-man’s contest. Oh, and that cat video. You’ve certainly had your hands full. Don’t feel bad at all. Just remember me when you’re famous. And that I wore your slap bracelets out in public for weeks. Oh, and I also confessed my love of Golden Girls and peanut butter cups for you on video for all the world to see. But that’s okay if you’ve forgotten little ol’ Maineiac Darla. I understand. Joining Darla in her pathetic attempt to ride on your bloggy coat-tails. Remember us little people when you get an Academy Award and win the lottery, which are sure to happen within the next few days the way your luck is going, Jules! First of all, LOVED it. Secondly, um, I’m with the others on the motion sickness. I never knew so much plaid existed. And that clock? The one that kept appearing with the I Heart Plaid words? It was like a subliminal message to get me to cross over to the dark side of all the plaid I shed when I left college. It’s probably best if I try to forget all the parts of the video without you or your son in them. 🙂 The parts WITH you both in them were FABULOUS! Better than I ever could have imagined. There’s just something about a disembodied arm clad in plaid twirling a baton that gets me every time. you’ll love it…it’s stylish in a ‘I-don’t-give-a-crap-anymore’ way, plus it keeps you warm on those cold winter nights. Disembodied arm clad in plaid? That should have been my post title. Haha. You had me at Space Balls. But did I keep you after Spaceballs? Everything looks better when John Candy’s involved. How could I not watch the whole thing! I now know what it feels like to lick a hallucinogenic scotsman’s kilt. Only 6 bucket items to go now. Finally saw your The Plaid Jacket video and LOVED it! So much talent out here! Maybe some day I’ll learn how to do blogging things and join the club. Peg had so much fun on this and did a lot of work so I’m glad to see you went over the top in honor of your winning. Fun, fun, fun! Hey Darla, don’t let Tar-Buns pretend to be just some innocent reader – I recognize this name. She was one of those depraved people who used The Jacket for strange party rituals. I believe she was wearing it ON HER HEAD in my photo expose. That wasn’t you? I could’ve sworn that was you. The one with the rainbow wig? Yes, that WAS me wearing the wig on my head. My sister Tar was wearing the jacket on her head. You’re doing the elliptical? Good for you! Go, go, go! Yup. Just finished another 40 minutes of huff-n-puff hell. After that Reese’s post and the Easter candy, I am exercising religiously now. Haven’t lost a single pound. And my heart feels like it’s going to explode. But it’s worth it. If you haven’t lost any weight and you’re about to have a coronary…how is it worth it? Good question. I was hoping maybe you would know? Well, there’s personal satisfaction, job well done, pip pip, cheerio, all that kind of crap. Eh. Doesn’t do it for me. I wrote SIX posts in ONE week. Never attempted that before and probably never will again. After my last post, I am tapped out for awhile. You might not hear from me for weeks. It was soooo much fun participating in the contest. And I do appreciate all the hard work Peg did to make it happen. It was only fitting to do a video in her honor and do the jacket the justice it deserves.